Ever thought to travel to Canada for your next holiday? Canada is a country loved by many due to its natural beauty and range of tourist destinations and attractions. Whether you want to enjoy a Canadian summer or cuddle up through the winter months Canada always has something to do such as hiking, shopping, skiing and more! Travel the Rocky Mountaineer: The Rocky Mountaineer offers over 65 different tour routes through Canada making you trip exactly as you design! Travelling along the Rocky Mountaineer gives you a train experience like no other; taking up the wonders of Canada one destination at a time. Niagara Falls: This natural beauty needs to be on your list right now! Waterfalls are always an eye catcher but this collection of waterfalls on the border of Canada and America really is one of a kind. Spend the day exploring the area along the Niagara River and make sure you take a camera! Banff National Park: Canada never fails to provide places of natural wonder and Banff National Park is no exception. Whether you want to see the local wildlife including Brown Bears or Moose or want to enjoy a tour through the park there is something for all adventure levels. 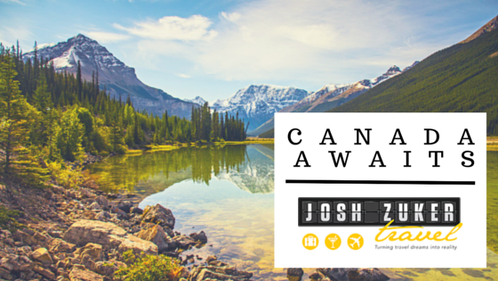 Ready to take the next step towards your Canadian holiday? Call Josh now on 1300 761 901.